Exercise Classes Start September 24th. Fitness for the 50+ ! 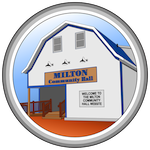 Exercise classes are starting again September 24th, at the Milton Community Hall. They will be happening Monday and Friday mornings at 9.a.m. Cost is $3 per class. Come learn about and test your own balance and flexibility with Angelie Carter. And if you're looking for something more to fuel your Monday and Friday mornings, stay around afterwards for Coffee Club at 10a.m. Enjoy some coffee and snacks by donation of coin or treats!